It will be either Florida, Oklahoma or Mississippi State for Atlanta quarterback Cameron Newton. With his senior year of high school football just a week away, there are moments when Cameron Newton wonders just exactly where did the time go? It only seems like yesterday that he was getting his thumb jammed as a freshman when he was taking the snap under center from his brother Cecil Newton, Jr. He still says a lot of prayers — faith is an important part of who he is — but the ones that probably do most of the praying these days are Westlake’s opponents. Cecil Jr. has moved on to Tennessee State where he’s a senior and the starting center. Cameron is now a senior at Westlake, big, strong and very athletic. He can beat you with his feet (he runs a 4.5 40) or his arm, which is plenty strong and very accurate. As a junior Cameron, who is rated four stars by Scout.com, threw for more than 2,500 yards and he ran for more than 600. He accounted for 32 touchdowns, 23 with his arm and nine with his feet. Those numbers only figure to improve as he comes back for one more year at Westlake with the goal of bringing the school its first state championship. “It’s really important to me to win the state championship this year,” he said. “We’re trying to build a real dynasty at Westlake but we have to win our first state championship to become a dynasty. We have to be the first team in our school history to make it past the third round of the state playoffs and we have to be the first one to win it all. He’s so dedicated to winning the state championship that he’s tried to do all the little extra things this summer to be the kind of leader it takes. As the quarterback, he is the one player that everybody on his team looks to for leadership. If he leads vocally and by example, he knows that his teammates will follow. From a personal standpoint, he’s spending a lot of time working with his receivers. It’s not just about throwing the ball and running routes. He’s trying to help them learn to adjust their routes when a blitz is coming, teaching them to recognize hot routes when they see certain coverages and helping them learn the audibles. All the extra work that’s been going on this summer by all of his teammates looks like it’s paying off in practice sessions that are lively and spirited. He says that one day it’s the offense’s turn to light it up. The next day the defense has the upper hand. Cameron Newton is one of the nation’s most highly recruited quarterbacks but he is determined that the recruiting process isn’t going to interfere with Westlake’s run at a state championship. 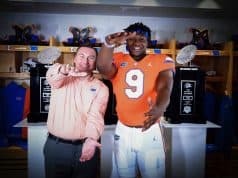 He’s narrowed his choices to Florida, Oklahoma and Mississippi State and the plan is to announce his commitment on CSS TV with Scout.com’s Scott Kennedy on September 7. 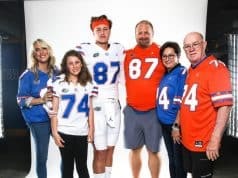 When he makes his decision it will be a happy day because he’ll know where he’s going to school next year but it will also be sad because he really likes the coaches at all three of his favorite schools. 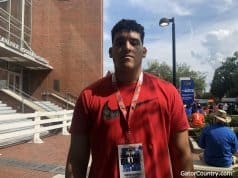 With the recruiting decision out of the way, he will be able to concentrate on his two chief goals — helping Westlake win that state title and graduating from high school early so he can start college in January.